In a large bowl, mix Nutella and cream cheese together until well blended and smooth. Add vanilla extract. Fold in whipped topping until no white streaks are left. Pour into Oreo Pie crust. Refrigerate for at least 2 hours. 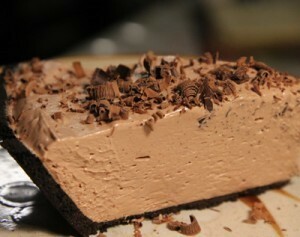 Optional: Shave chocolate with veggie peeler on top of pie for garnish. I found the original recipe online, but after a week of sharing it the link stopped working. The original recipe was for individual servings and took a lot more prep time and tools. I adjusted the recipe to make things faster and more child friendly. Also, if you want, you can make your own crust using chocolate wafer cookies or graham cookies and melted butter, instead of buying a ready made crust.